Ready for the line? 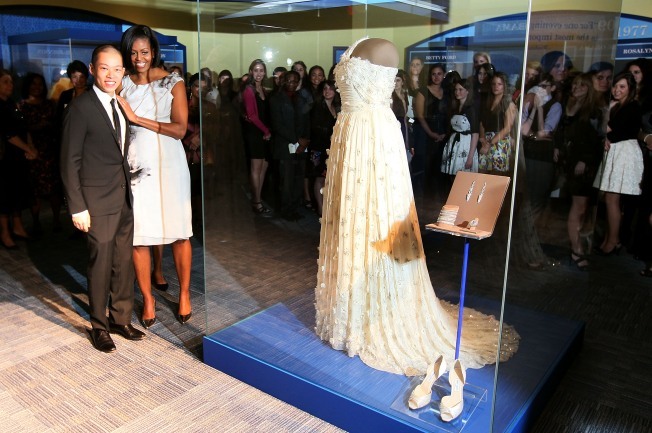 Local Targets open at 8 a.m.
First lady Michelle Obama with designer Jason Wu at the Museum of American History in March 2010. Fashionable fans of the First Lady, listen up. Soon you, too, will have access to the styles of Jason Wu, who designed Michelle Obama's famous one-shouldered inaugural ballgown. Wu is launching his new collection, Jason Wu for Target, on Sunday, Feb. 5, inspired by the "American girl in Paris" motif. The collection will be available at local Targets including Columbia Heights (3100 14th St. NW), Potomac Yard (3101 Jefferson Davis Highway, Alexandria, Va.) -- where the first lady herself has shopped -- and Fairfax (10301 New Guinea Road, Fairfax, Va.), featuring a variety of blouses, skirts, handbags and scarves for women. The collection ranges in price from $19.99-$59.99 for apparel and $19.99-$49.99 for accessories. Sheryl Baker, the exceutive team leader for softlines at the Columbia Heights Target, said she expects quite a crowd, especially after the the reaction they had with with the Missoni for Target launch in September. "I do expect it to be sold out by mid-afternoon," she said. Baker advises customers to arrive as early as possible: "What we do have is what we will have," she said. Though the collection is set to be in stores through March 6, Baker said the Columbia Heights Target may receive more shipments of accessories, but not the clothing. Both the Columbia Heights and Fairfax stores will be operating on regular hours (8 a.m.-10 p.m.) on Sunday. Target executive John Cagle said while he also anticipates a "good amount of people" to show up at the Fairfax location, he adds that the store has dealt with similar launches in the past and that there will be a "good team in place" to assist customers when the store opens. "We're pretty equipped," he said.